Don't Forget Hershey's Candy This Halloween! When you think of Halloween candy, what do you think of? 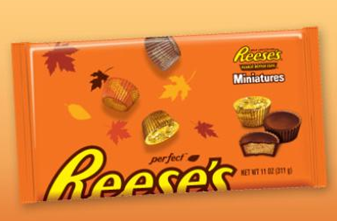 I know my husband would say REESE’S Peanut Butter Cup Miniatures from Hershey's because that is his favorite candy!!! So he was so excited when we received a couple bags of Peanut Butter Cup Miniatures from Hershey's to help us celebrate this Halloween! They have these super cute Fall bags of Reese's Miniatures and they can really add some color to your home this fall with the perfect combination of milk chocolate and peanut butter. The festive foils come in harvest hues of gold, orange and brown and they hold the same melt in your mouth peanut butter cups in a mini size that my husband has LOVED for years! So as you get ready to celebrate Halloween tomorrow, head over to Hershey’s Boo Blvd and find some awesome craft and recipe ideas for Halloween! You will be all set with decorations, crafts, recipes and so much more with the help of Hershey's this year!